November can be a great time to find solitude and wild trout on the Gunpowder River, but watch your step out there! Anglers should be aware that the browns are beginning to make spawning beds, (Redds) and that wading and fishing should be done with caution. November can be a great time to find solitude and wild trout on the Gunpowder River, but watch your step out there! Anglers should be aware that the browns are beginning to make spawning beds, (Redds) and that wading and fishing should be done with caution. In the picture above are two beds, which are clearly defined against the dark river bottom. 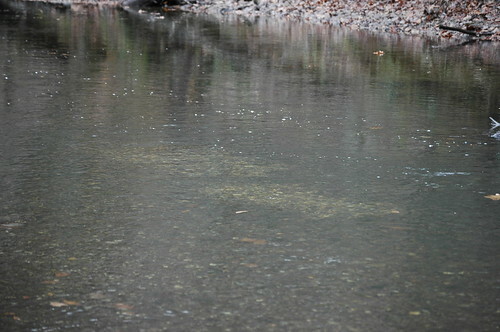 Anglers must pay close attention while wading through riffles, so as not to disturb the areas the fish have cleared. Attempting to catch paired up wild trout off spawning beds can have adverse effects on each trout’s contribution toward the next year class of browns. Browns will often make a redd, hide some distance away for days or weeks waiting for a mate. Once the time is right the browns pair up and spawn, and even protect the eggs for some time after. Consider the future of the fishery by not targeting browns in shallow water over clearly defined orange-yellowish gravel beds. This entry was posted in fishing report on November 9, 2008 by Jason du Pont.